Year 1 and 2 pupils had drawing workshops with Catherine drawing mini-beasts and their habitats for the design for the main school gates. The gates were looking scruffy and battered so the school decided a transformation was needed. The drawings were collaged into a design by Catherine, accurate measurements of the gates were taken by Becky and the marine ply wood (ethically sourced) was cut to shape by Olivia. 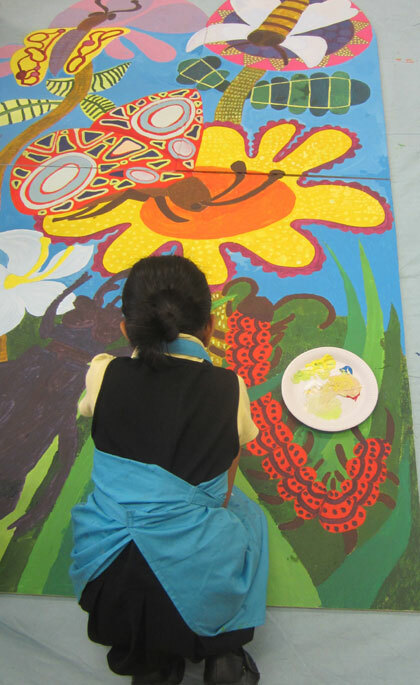 Pupils spent 2 weeks in small groups mixing acrylic paints and painting them onto the primed wood. 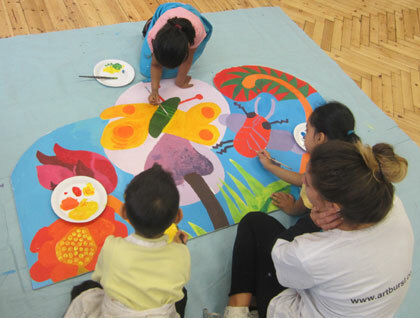 They learnt lots about colours and painting techniques, first blocking the colours in and then adding patterns and fine details. The gates were then varnished several times to ensure they will last and then they were proudly put into place. The children love them and they have made a huge difference to the street and to the inside of the playground. "The gates look great - we are very happy with them." "Maud, the gates look fabulous!"